So we have woken up all excited about to Andorra with some of the guests, who were staying at the holiday gites, where we were at workaway in Cautirac. These guest were great fun, "do you remember the story about the rutting season in a previous blog I wrote?" "Well, if you do these are the guests!" We have built an amazing relationship with them, and we still keep in contact with them now! Well, we are all ready for our trip to Andorra, you never know what to expect in the way of weather so we plan for everything! so the trip to Andorra is about 1hr 30 mins from where we are, it takes us ages just to get down the bottom of the mountain where we are based. Well the drive was smooth and we were very lucky with the traffic and the scenery is beautiful, the only problem was the guest driving the other car, was afraid of heights and we were heading for a mountain road, which has a steep fall so you can imagine! He did great though, he just did not look down! Well, we all arrived at Andorra for the first time ever! all you can see is lots of shops selling alcohol, cigarettes etc..... and the most colourful building I have ever seen. Andorra has lots of other shops too! 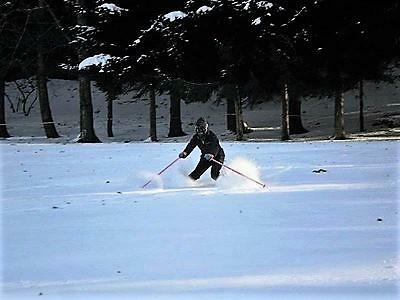 For those of you who love to ski! I love to ski, but I need more practice, like the time I skied on the backfield at Michelle and RC'S place, and landed in the lorel hedge and just before that I ended up on my bottom with my knees together and the skies both out to the side, that was painful! I have not given up though! 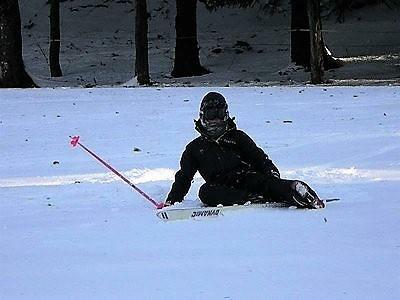 This is me when I lost one of ski's on another attempt! so we are driving into Andorra, looking for a car park, as we drive around the corner we see this! 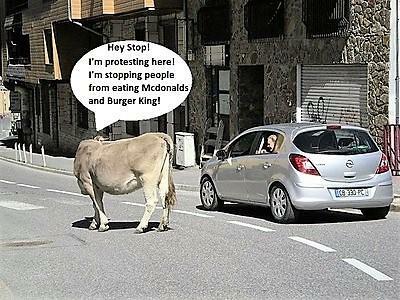 The cow is on the road, just up from Burger King, we couldn't believe it, of all the places the cow could have been, it was there! Somehow I do not think the cow was showing us the way! Anyway, after our encounter with the cow near Burger King, we finally found a car park and got something to eat and looked around Andorra. "We all had a Superfantastic Day"
So the moral of this story is to plan for everything! And always expect the unexpected! Thank you for taking the time to read my blog, please comment below and like and share on social media platforms.